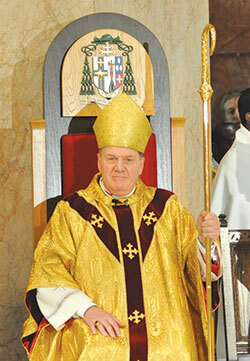 Archbishop Joseph W. Tobin shared a telling message about “the obligation of love” when he was installed as the sixth shepherd of the Archdiocese of Indianapolis on Dec. 3, 2012. In a homily he delivered during the Mass at SS. Peter and Paul Cathedral in Indianapolis, the archbishop reflected on how St. Paul saw himself as obligated to preach the Gospel because Christ loved him first. “And so, for us Catholics of central and southern Indiana, if someone asks us, ‘Why do you do what you do?,’ it’s not simply because we’re obeying rules,” Archbishop Tobin said. Archbishop Tobin said that he and the Catholics of central and southern Indiana are to express that love with the passion that drove St. Francis Xavier, a patron saint of the archdiocese whose feast day is Dec. 3, to preach the Gospel in India—halfway around the world from his home in Spain. Archbishop Tobin also called upon the example of the Servant of God Bishop Simon Bruté, the first bishop of Vincennes, to explain how to love and avoid the opposite of love—fear. He then described the people with whom he will minister as shepherd of the archdiocese—the priests, deacons, religious and lay faithful of central and southern Indiana. Archbishop Tobin then recalled a saying of Bishop Bruté. Archbishop Tobin also paid tribute to his immediate predecessor, Archbishop Emeritus Daniel M. Buechlein, who attended the installation Mass.